The BBC’s weekly The Boss series profiles a different business leader from around the world. This week we speak to Andy Mooney, chief executive of US guitar company Fender, and formerly a senior executive at both Nike and Disney. Andy Mooney was standing in line at an ice rink in Phoenix, Arizona, when he had a eureka moment that continues to earn entertainment giant Disney more than $3bn (£2.4bn) a year. This was back in 2000, soon after Mr Mooney, a Scot, had been appointed head of Disney’s consumer products division. Joining the company after 20 years at Nike, he was working hard to bring himself fully up to speed on every facet of the business. This included going to see a production of Disney on Ice, where figure skaters portray Disney characters. While queuing to get in he noticed that a great many of the young girls – and also their mothers – had dressed up in generic princess dresses, to look like Disney heroines, such as Snow White, Cinderella, and Aurora from Sleeping Beauty. Disney didn’t sell such dresses at the time, but Mr Mooney immediately realised that the company was missing an incredibly lucrative trick. “I was standing in line with mothers and daughters, all dressed head to toe in princess regalia that they had made at home,” says Mr Mooney, 63. “I said to a few of the mums ‘if Disney made official dresses like this would you buy them?’, and they all replied that they’d buy lots. Not only did Mr Mooney and his team introduce dresses based on those worn by Disney’s best-known female characters, they set to work on everything from books to lunchboxes, dolls, magazines, computer games, pyjamas, and tie-ups with food producers. The idea was to start selling basically everything that female Disney fans, both young and old, might like to buy, all featuring one or more Disney princess. “By the end of 2001 sales across the Disney Princess lines were something like $300m, and today it is more than $6bn a year,” he says. This is not the success in life that Mr Mooney could have dreamed of when he grew up in a council house in the small Scottish town of Whitburn, half way between Glasgow and Edinburgh. The son of a miner, he left school at 16 to train as an accountant at his local tyre factory. Yet from this modest start, he went on to play a key role in the growth of US footwear and sportswear company Nike. 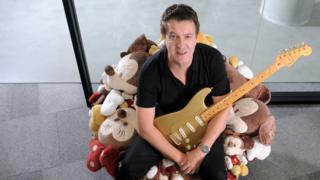 And after his success at Disney, he is now chief executive at Fender, which – for someone who has been an avid guitar player since he was a teenager – is his “dream job”. After a number of years at the tyre plant Mr Mooney switched to a similarly unglamorous junior accountancy role at the local ironworks. Then aged 25, in 1980, he took his first steps towards to the top of the US corporate world when he applied for, and got, the job as chief finance officer of Nike’s UK operation. “In the interview they didn’t ask me anything to do with my accountancy background, it was all about whether I was a cultural fit,” says Mr Mooney. At the time Nike was primarily selling running shoes, so to best understand the business and his products Mr Mooney says he switched from playing football to jogging. “I picked up running when I joined, and I have stuck at it ever since, running marathons around the world,” he says. While Mr Mooney’s day job was a financial one, he started to impress his bosses with his gut instinct for what shoes would sell particularly well, and how Nike could best sell more of them. So much so that Nike UK switched him to head of marketing in 1982. Two years later he was poached by the marketing team at Nike’s head office in Oregon, rising to the become chief marketing officer. While at Nike Mr Mooney was a key mover behind the introduction of special limited editions trainers, when inspiration came to him at a set of traffic lights. “I had become relatively successful, so I could afford to buy a very bad used Porsche 924,” he says. After 20 years at Nike Mr Mooney says that Disney approached him, and he left for a fresh challenge in 2000, taking up the head of consumer products role. He stayed with Disney for 11 years before leaving to spend just 26 months as chief executive at sportswear brand Quicksilver, where he admits that for once things didn’t work out for him. When he joined Quicksilver it was struggling with debts of more than $1bn. The top position at Fender followed in 2015, which Mr Mooney says really is “an honour” for someone who already had a collection of more than 40 guitars. While he says that Fender’s annual turnover is a very respectable $500m, he wants to help increase this by reducing the number of people who give up on trying to learn to play their guitar. To help more people learn how to pay their guitar (and then potentially buy another), Fender launched “Fender Play” last year, online guitar tutorials that are now used by 70,000 people. “He has a strong marketing background, and has proven adept at first understanding the customers his businesses were targeting, and then using that knowledge to diversify and grow revenues. When not busy at work Mr Mooney now jams with some of his guitar heroes, such as Tom Morello of Rage Against The Machine, and Jim Root of Slipknot. And he has swapped Scotland for Los Angeles’ exclusive Hollywood Hills. “I do have to pinch myself,” he says.